IMPROV kitchen: wish me luck! Hey Guys! 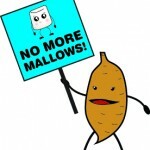 North Carolina Sweet Poatato Commission is hosing a recipe contest taking a stand against the marshmallow + sweet potato combination. I decided to enter my awesome brunch hash into the contest, wish me luck! 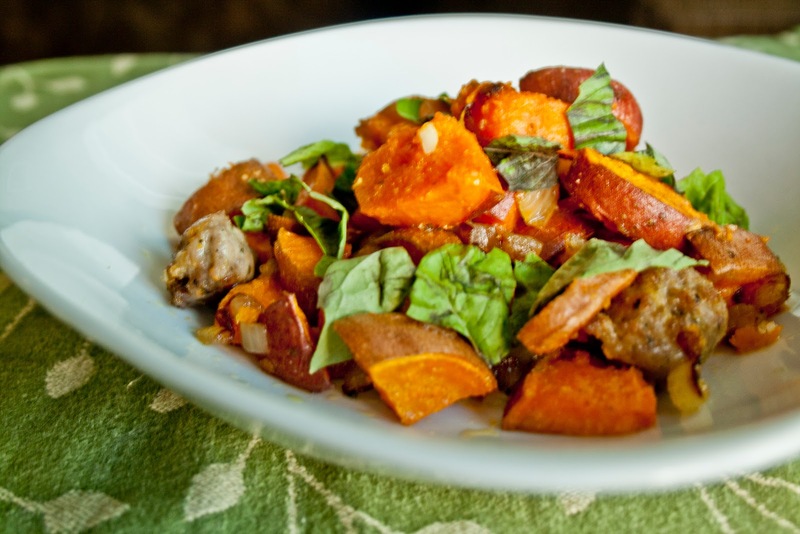 Be sure to check out all of the great sweet potato recipes they have. 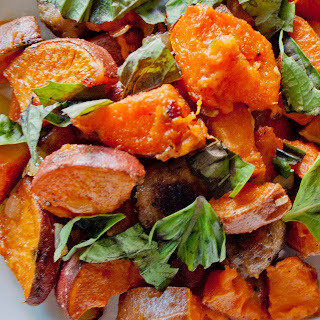 What fun sweet potato recipes do you have?! 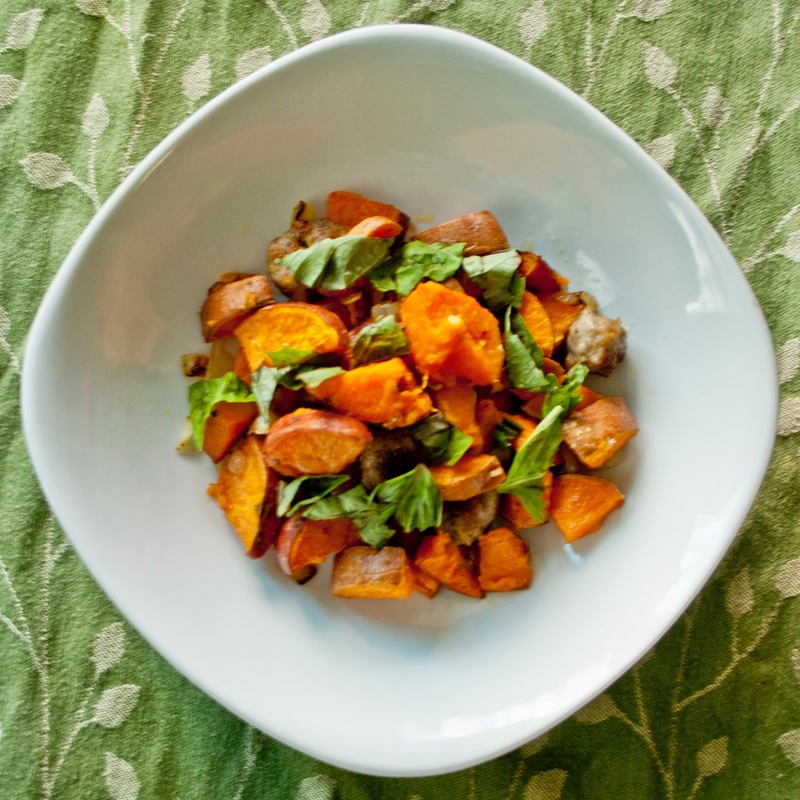 Preheat oven to 400º F. Dice sweet potatoes to your preferred size. Drizzle 3 T. olive oil and salt + pepper to taste over the potatoes and place on baking sheet. Roast potatoes for about 20 minutes while you prepare the rest of the dish. Heat a skillet on medium and add 1 T. olive oil and the sausage links (casing removed) crumbled. Cook until browned. Next add onion and cook until translucent. Add in garlic and seasonings and cook for 1 - 2 minutes. Pull your sweet potatoes out of the oven and add them to your pan. Cook for an additional 2 minutes. Tear basil leaves and sprinkle over the top of your dish before serving. there's a million ways you can improvise this dish. don't have sweet potatoes? you can use any kind you like: yams, yukon gold, red, fingerling, you get the idea... same goes with the sausage: breakfast, all mild, all spicy, chorizo, pork, chicken, jalapeno chedar. not a fan of sausage? bacon, canadian bacon, diced ham, or pancetta would all be lovely substitutions. this is a throw what you got in a pan and make it kind of hash. add in your favorite herbs. think oregano, chili powder, thyme, parsley. i think it would be even better if you topped it with a poached or fried egg with a slightly runny yolk (no eggs for me for another 23 days - sigh). also, you can cook the potatoes in the skillet if you prefer. i like the oven because i can get everything else prepared faster while the potatoes get nice and soft in the oven.